Enhanced scanning is configured as part of the anti-malware settings that are applied to a policy or individual computer. For general information on configuring anti-malware protection, see Protect servers from malware in four steps. Enhanced scanning may have a performance impact on agent computers running applications with heavy loads. 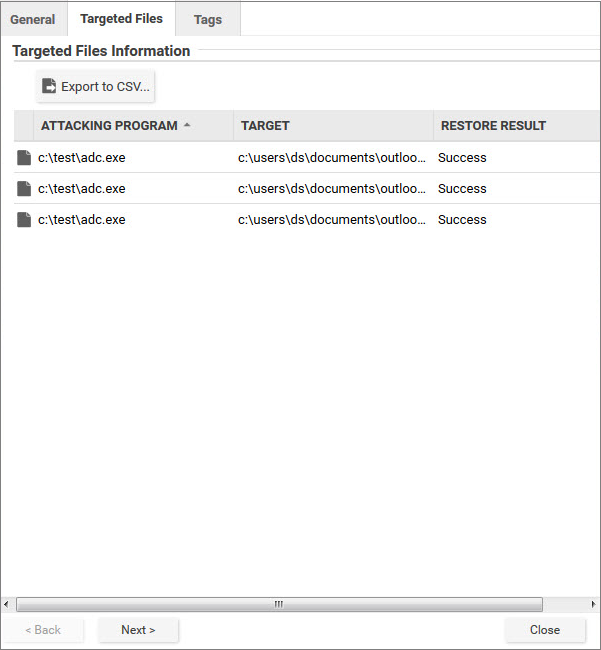 We recommend reviewing the Performance tips for anti-malware before deploying Deep Security Agents with enhanced scanning enabled. 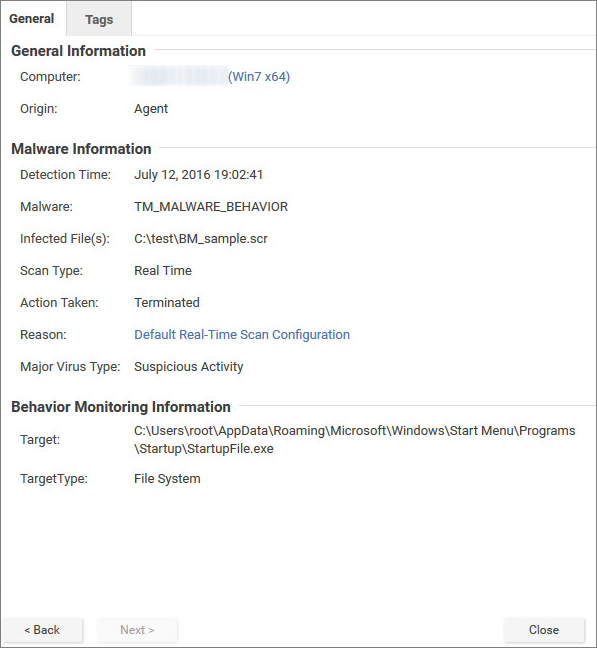 Double-click an existing real-time scan configuration to edit it (for details on malware scan configurations, see Malware Scan Configurations). When Deep Security discovers activity or files that match the enhanced scan settings you have enabled, it will log an event (go to Events & Reports > Events > Anti-Malware Events to see a list of events). 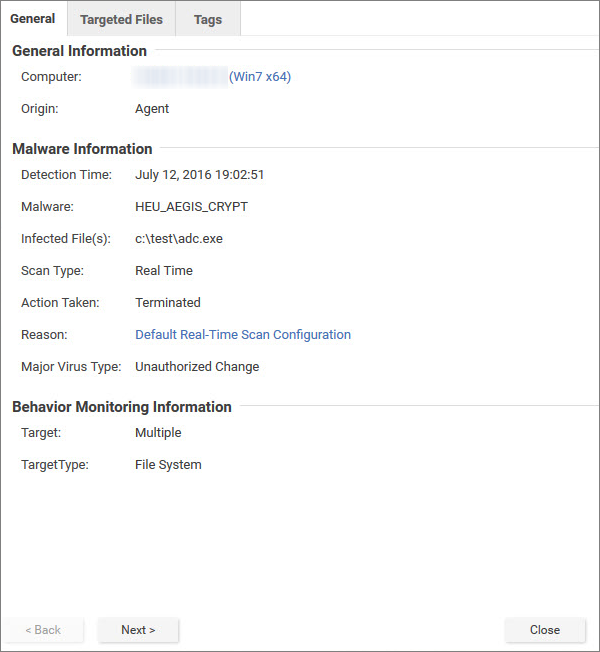 The event will be identified as “Suspicious activity” or “Unauthorized change” in the Major Virus Type column and details will be displayed in the Target(s) and TargetType columns. The enhanced scanning features described in this article require internet access to check files against the Global Census Server and Good File Reputation Service. If your Deep Security Agents cannot access the internet directly, you will need to configure a proxy to enable agents to check those sites. If the agent cannot check the Global Census Server and Good File Reputation Service, the detection rate for scans will be very low. For example, ransomware will not be detected and process memory scanning will also be affected. In the policy or computer editor, go to Settings > General. The settings are in the Census and Good File Reputation Service section. If the Inherited checkbox is selected, the proxy settings are inherited from the parent policy. To change the settings for this policy or computer, clear the checkbox. Ensure that the When accessing Global Server, use proxy checkbox is selected and in the list, select New. A dialog box appears, where you can configure the proxy settings. Be careful when configuring the proxy settings because Deep Security does not perform a check to make sure they are valid. If you have configured Smart Protection Server proxy settings in the computer or policy editor, under Anti-Malware > Smart Protection > Smart Protection Server for File Reputation Service, you may want to use the same settings here.